Our Dubai cruise port guide gives you information about the docking location, cruise dock, transportation options and much more! 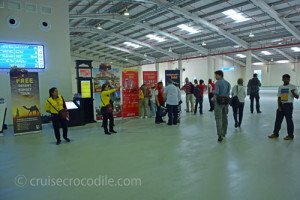 Welcome to the Dubai cruise port guide. Dubai is that tiny emirate with 2,1 million inhabitants and without doubt this is one of the fastest growing cities in the world. An army of men is working around the clock to build the city that the whole world will look up to. 40 years ago Dubai was barely a small village in the middle of the desert. It was located in one of the hottest and inhospitable places on earth and little known as a simple trading post in the Arabian Gulf. And than they found oil… Today it is a metropolis, oasis in the desert and a concrete jungle with hundreds of skyscrapers. Luxury has a different meaning in Dubia and you about to discover how far this can go. This city of many faces can be modern and deeply traditional, but also extravagant with strict rules. 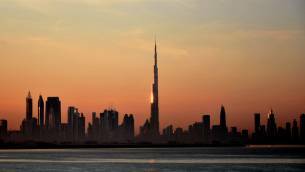 Only about 17% of the inhabitants of Dubai are Emirati. The rest is either expat or a hard worker from India. All of this gives the city of Dubai a unique flavour and a atmosphere that is not met anywhere else in the world. This is the port of Rashid where cruise ships dock when calling into Dubai. 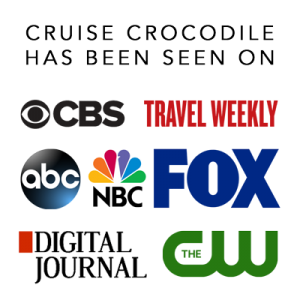 There is a set of 6 docking locations all equipped with high end cruise terminals. Often the shopping malls in Dubai offer a free shuttle service to their mall. Check their schedule at these booths. At the cruise terminal in Dubai you will find several facilities. There is tourist information, exchange facilities and hop on hop off bus respresentatives. Sailing into Dubai is something you simply cannot miss. See the sunrise over the skyline of the city while you approach your destination for the day. Be sure to be on the outside deck 1 hour before you dock. The official taxis of Dubai are beige with another color roof and they have a meter. Find them at the cruise terminal and in the city at the mayor sights. Cruise ships dock at the Port of Rashid. Dubai’s cruise port is the largest cruise terminal in the world. It can accommodate 6 ships at any given time. There are several cruise docks behind on another and they are all connected to the cruise terminals: Terminal 1, terminal 2 and terminal 3. These cruise docks have all the facilities a cruise guest could want: Tourist information, postal services, mall representatives, currency exchange, wi-fi, souvenirs shops and taxi stand. Depending on where your dock it is usually a few km to the exit of the port. It is not recommended to walk from the cruise terminal to the city of Dubai. The way to get out of the port area is by excursion, taxi or shuttle. 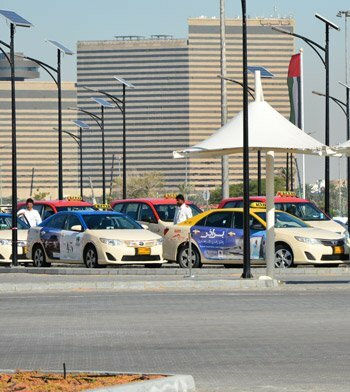 The official taxis of Dubai are beige with a coloured roof (usually red, green or blue) and they have a meter. Taxis are allowed to drive in and out of the port. Sometimes it can be tricky to have them take you out of the port for a reasonable price. They usually want to negotiate a price rather than to drive on the meter and this usually results in a price of about 40 US dollars (depending on your bargaining skills) to Deira, which should be about 20 dirham if you drive on the meter. Officially your starting rate should be 5 dirham starting fee (starting fee from port is higher though) and 1,72 dirham per km after. Coming back to the port driving on the meter is usually no problems, but check with the driver before you step into the taxi. Your ship should provide a shuttle service into town although this is not the case with every cruise line. Check with your front office on board if they will provide one and what the details are. In the cruise terminal there are usually these booths like you see on the right hand picture. 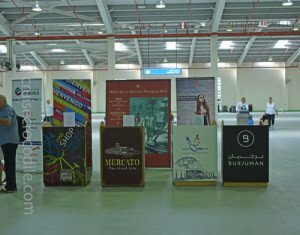 They are representatives of several shopping malls in Dubai. These malls usually provide a free shuttle bus service to their mall. Keep in mind this service usually starts at 09.30 am. Check the schedule of the shuttle service for that specific day at the booth in the terminal. When you are travelling by public transportation in Dubai it is essential you get yourself a NOL card. This public transport card is valid on Dubai’s metro and bus. Buy a single ticket of a day pass (22 dirham) at the machine with Dirham cash or credit card (visa or master card). Traveling by metro is a fast, cheap and easy way of doing it. From the ship it is wise to take the taxi or mall shuttle to Burjuman shopping mall / metro station. Pick up the metro here and cover large distances within no time. This system will work well for you because Dubai is quite stretched out, it goes frequent and you won’t be stuck in traffic. There are hop on hop off buses in Dubai and there are even several companies. Usually the 2 biggest will come to the terminal building with their buses. These buses are quite expensive and here is some special advice from our side: when you are in the terminal negotiate with the representatives of the hop on hop off buses! In front of the Dubai Mall and Burj Khalifa is where you will find the Dubai Fountain. This is the world’s largest dancing fountain, built for 226 million dollars. The fountain can shoot as high as 500 ft, that is the equivalent to that of a 50-storey building. Make sure not to miss the show. Double click here to be forwarded to the page with the showtimes on them. This attractions is located in the Dubai Mall. This 10-million litre Aquarium tank is the largest suspended aquarium in the world. It houses thousands of aquatic animals, comprising over 140 species. Over 300 sharks and rays live in the this tank, including the largest collection of Sand Tiger sharks in the world. Find the Aquarium on the Ground Level of the Dubai Mall. The chance you leave this souk empty-handed is very small. The Arabian world and cuisine is known for the many scents and spices, perfumes and oils. The Spice Souk consists of 2 streets where thousands of products are being offered. The Sheikh Zayed Road is without doubt the most impressive road of the emirate. It runs parallel to the coast and has over 50 skyscrapers on it. That is more per block than in Manhattan. The Dubai Creek runs straight through the Northern part of the city centre. To get across most people take the traditional Abra. For a small fee you can enjoy a beautiful ride over to the other side. Dubai Creek Originally it all started here at the Dubai Creek in the 16th century. Traditionally this is the centre of Dubai’s business. North of the creek is where we find Deira, south Bur Dubai and together these make up 2 perfect neighbourhoods in sheer contract with the rest of Dubai. Explore them by foot and meet a piece of traditional Dubai. Out of all the buildings in Dubai the Burj Khalifa must be the pearl of them all. It is the tallest man made structure in the world. It almost twice as tall as the Empire State Building. It is a city in the sky with 164 floors and a length of 828 meter / 2715 feet tall. 35.000 people can live and work in this tower. You can visit the top for an incredible view over Dubai. Do know it is wise to book this ahead of time through their website, because it is often sold out upon arrival. This is one of the oldest shopping malls in Dubai. This mall has won several prices as “Mall of the year” etc. Find many interesting stores inside. It is also good to realise that this is the perfect location to start your journey in Dubia. If you exit the port by shuttle or taxi it is wise to chose to go tho this mall. There are tuns of tours offered here at the entrance of the mall or you can hop on the metro here. The city has a extensive metro system. There are 2 metro lines running through the city. The metro is easy, cheap and incredibly fast. The NOL card This is the public transport card of Dubai. Buy a ticket on the machine. You can buy single and day tickets. Pay in Dirham cash or credit card. This house is located in Al Ahmadiyya Historical district. It was built in 1890 by Mattar bin Muzaaina. It is recognised as one of the Dubai’s best examples of a traditional Emirati family home. Visit it to get an inside peek. Dubai is all about shopping and together with the Dubai Mall this is the most spectacular one. Aside from hundreds of stores you will also find tourist attractions inside like Ski Dubai, that’s right: you can go skiing inside this mall. The port and the mall are quite far from each other and therefore the best thing to do is to take the metro to Mall of the Emirates metro station. At the foot of the Burj Khalifa you will find the Dubai Mall. It is the worlds most visited shopping and leisure destination. It is a mall of epic proportions that welcomes more than 75 million visitors in 2013. There are over 1200 retail stores and 200 food and beverage outlets. Go here for shopping, but also make sure to visit one of the many attractions inside like: The Aquarium and underwater zoo, Ice Rink or Emirates A380 experience. 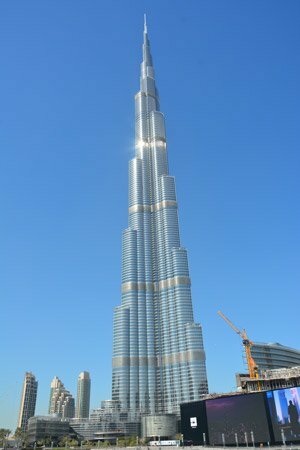 This is one of the most iconic buildings of Dubai. It dominates Dubai’s skyline, designed to resemble a traditional dhow. It is the 4th largest hotel in the world completed in 1999. It is 321 meters high and its the world only 7 star hotel. A night at this palace would set you back at least 1200 dollars. If you are interested to visit the hotel you will need to make reservations ahead of time. The Dubai cruise dock is located in Port of Rashid. It is one of the largest cruise terminals in the world. You will find 6 cruise docks here which are all connected to a beautiful cruise terminal. Most cruise terminals in Dubai offer tourist informations, souvenir shops, currency exchange etc. The Port of Rashid is rather large and it could be your cruise ship docked a few km’s from the exit of the port. We highly recommend you not to walk through the port area by yourself. Therefore, the way to get out of the port is either by excursion, taxi or shuttle. 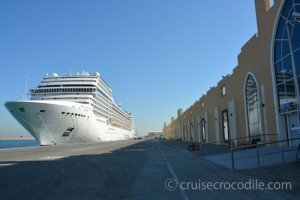 Read our full Dubai cruise port guide for all the information on this port of call. Shopping in Dubai is every shopaholics dream and you could go to the super malls or go for the traditional souqs. These are the traditional markets. Most of the souks are located around the Deira area. This is where you can find the Spice Market, Gold souq, Perfume sous, covered souq and fish souq. The textile sou is just on the other side of the creek. Find their locations on the map. Keep in mind souks could close between 1 and 4. Dubai is known for a few things and gold is definitely one of them. You don’t have to be on the hunt for gold to be able to enjoy a sight like this. Just take in the business, hustle and bustle of it all. The stores offer platinum, diamonds and occasionally silver. Buying gold of the street vendors might get you a “genuine fake” but the government keeps tight control over the quality of the merchandise of the shop owner, so rest assured.